After a frighteningly mild start, winter has arrived with a vengeance. I am home for a second snow day in two weeks. And it looks like we may call off school for another day or two this week because of frigid temperatures. This is not a good thing. We only budget for two weather days per school year, so we have to add minutes or days if we have three or more weather days. Not that I'm complaining today. A three-day weekend is always nice! However, after I post this, I need to take a walk. The temperature is around 0 -- and that is about as warm as it is going to get for this week. And then I need to do some paperwork for school. Those special ed deadlines do not shift for snow days! I've started a second Dewberry cowl with a skein of Sun Valley fibers. 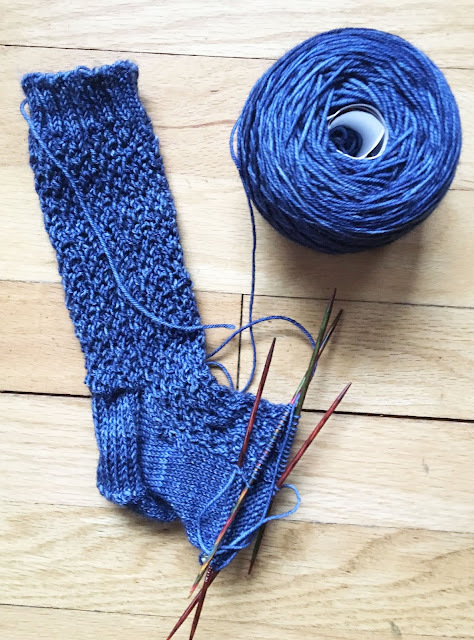 The yarn is super-soft and the perfect shade of blue to wear with denim. I finished my Soundwaves Shawl and I'm not sure I'm happy with it. It hasn't been blocked, but it looks like the outer edge isn't going to accommodate the top edge smoothly. I looked at Ravelry, and I'm not the only person to run into this issue. We'll see if blocking helps. On the first snow day, I went skiing on the bike path with some friends. It wasn't too bad. And it was nice to ski without driving Up North. 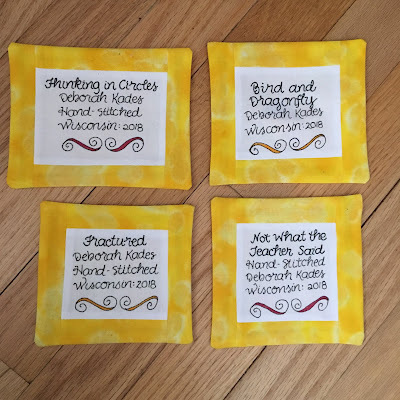 I have been finishing up small art quilts, so I have a stack of them that need quilt labels. I spent about an hour this morning making some. I am just very slow with a sewing machine. I don't mind hand-sewing them onto the quilts. It really does look like Tsela. However, her couch is gray. I just wanted to get some more color into the picture. These cold, snowy days make me happy (yes, I know that is not normal). 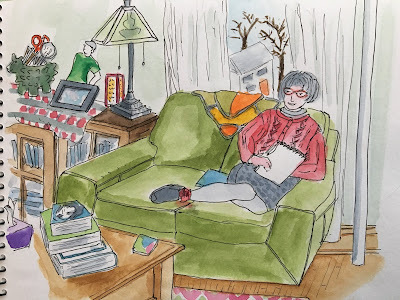 It is just so cozy to be inside with a fun knitting project and a cup of tea when the weather is so bad. I hope you are enjoying the weather where you are! Yarn and winter just go together. There are a lot more opportunities to wear wool in Wisconsin than in points south. 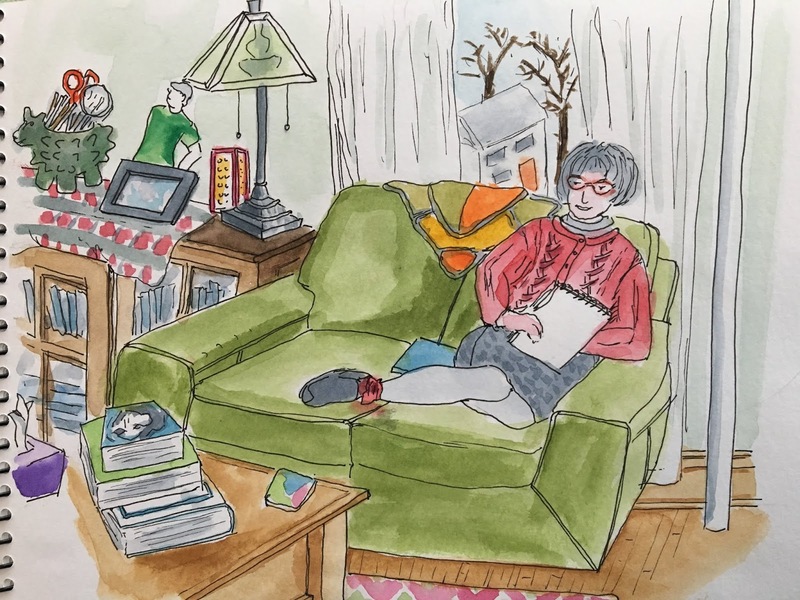 And there is something extra cozy about knitting when it's cold outside. 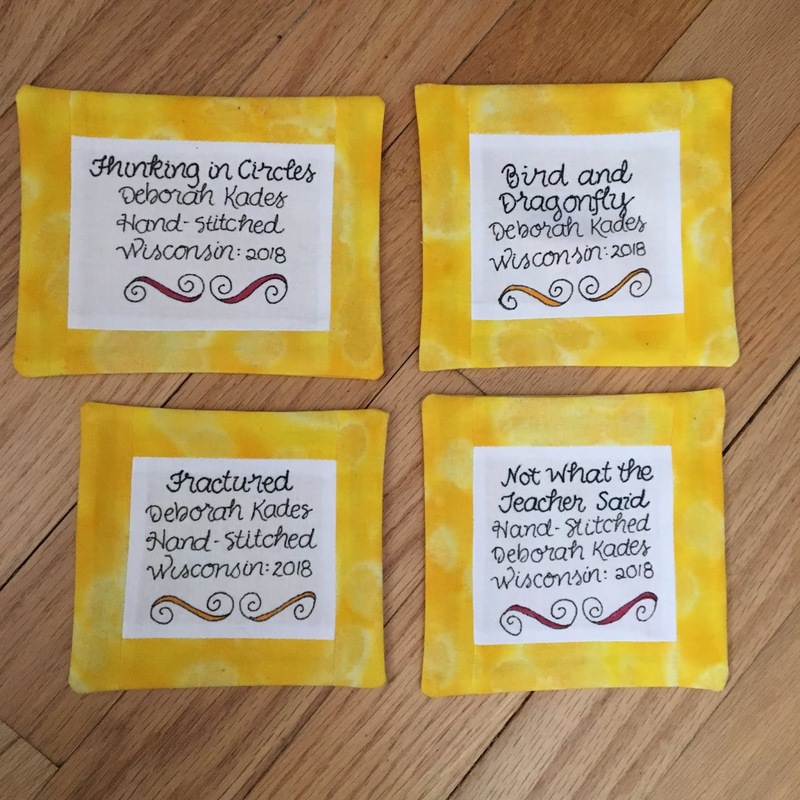 I spent a chunk of this weekend at my Knitters Guild winter retreat, held in the cute little town of New Glarus. My husband can't believe this events exists. "So you just sit around all day and knit?" he asks disbelievingly. At this point he just shakes his head. These are the Go With the Flow Socks from Interweave's Favorite Socks book. I wanted a simple pattern that would show off this gorgeous yarn from Ewetopia, one of my favorite Wisconsin dyers. And I'm close to finishing my Soundwaves shawl. It's hard to get a feeling for what this shawl is like because it's large -- two skeins of sock-weight yarn -- and very scrunched up on the needles. But I think it's going to be very cozy and pretty. The only bad part is that today I have a stomach bug, so I went to bed as soon as I got home from New Glarus. 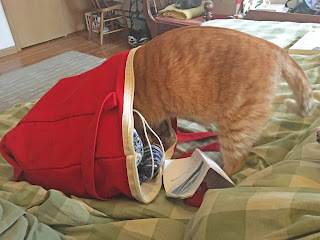 I have had good company; Kola enjoyed exploring my knitting bag before settling down to nap by my side. I hope that I feel better in the morning. We are a week away from finals, so I can't miss work next week! First of all, I hope the new year is beginning well for all of you! Mine started out well with a walk in the freshly fallen snow followed by lunch with friends. Natural springs melt enough show for a little stream. -An American Marriage by Tayari Jones. I listened to this one, and I enjoyed it a great deal. It's the fictional story of the marriage of two Black professionals and how their lives are affected when the husband is falsely convicted of a violent crime. This a well-written book with a compelling plot that has a lot to say about being Black in America today. -Educated by Tara Westover. I listened to this one, too. A gripping story about growing up in a conservative Mormon family with a father who is both a survivalist and bipolar. Tara's journey to Cambridge is inspiring. 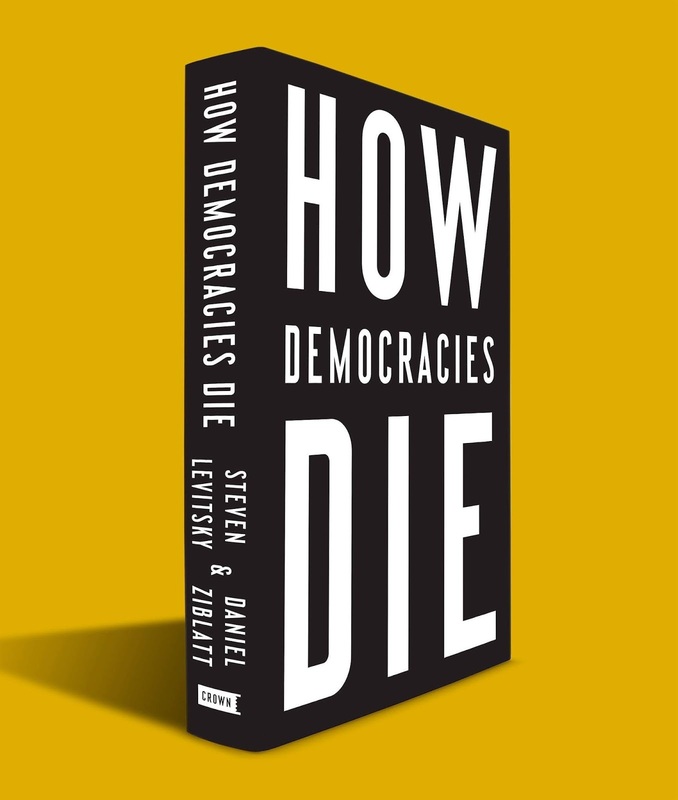 -How Democracies Die by Steven Levitsky and Daniel Ziblatt looks at history to relate how leaders can destroy democracies. 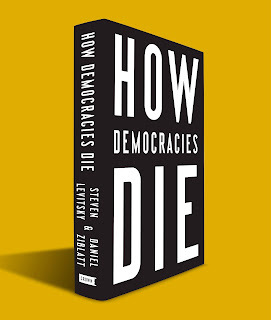 A scary and essential read at this point in time. - There There by Tommy Orange sounded like a book I would love. It follows a handful of characters in the Oakland, CA, area before a pow-wow. Everyone I know loved this book. I didn't even finish it. The characters just didn't sit well with me. -Asymmetry by Lisa Halliday was possibly the most praised work of literary fiction in 2018. I'm not sure I can finish this one, either. Yes, the writing is strong, but the story of a 20-something aspiring writer and an elderly literary star is passionless and dull. Halliday herself had an affair with Philip Roth when she was younger. My most-fun read of 2018 -- well, actually, listen-- was a book I would never have picked out if so many of my treasured blog friends hadn't talked it up. So my sincere thanks to all of you who recommended: Eleanor Oliphant is Completely Fine by Gail Honeyman. I listened to this one, too, which I highly recommend. The reader captures the accents and inflections of the characters -- without taking on such a strong brogue that the dialogue is difficult to understanding. Listening to this book was sheer joy.